(AP) MEXICO CITY - The party that ruled Mexico with a tight grip for most of the last century has sailed back into power, promising a government that will be modern, responsible and open to criticism. Though Institutional Revolutionary Party candidate Enrique Pena Nieto's margin of victory was clear in the preliminary count from Sunday's election, it was not the mandate the party had anticipated from pre-election polls that had at times shown the youthful, 45-year-old with support of more than half of Mexico's voters. Instead, he won 38 percent support, about 6 to 7 points more than his nearest rival, with 92 percent of the votes counted, and he went to work immediately to win over the two-thirds who didn't vote for him, many of whom rejected his claim that he represented a reformed and repentant party. "We're a new generation. There is no return to the past," he said in his victory speech. "It's time to move on from the country we are to the Mexico we deserve and that we can be ... where every Mexican writes his own success story." But his top challenger, leftist candidate Andres Manuel Lopez Obrador, refused to concede, saying he would await a full count and legal review. He won roughly 32 percent of the vote, according to the preliminary results. Lopez Obrador in 2006 paralyzed Mexico City streets with hundreds of thousands of supporters when he narrowly lost to President Felipe Calderon. This time, only about 700 gathered at his campaign rally and he canceled plans to proceed to the Zocalo, the main square he filled as recently as Wednesday. "We have information that indicates something different from what they're saying officially," he said. "We're not going to act in an irresponsible manner." But Spanish President Mariano Rajoy already recognized Pena Nieto as the winner, sending him a telegram Monday congratulating him and offering him "all of Spain's support." The PRI for 71 years ruled as a single party known for coercion and corruption, but also for building Mexico's institutions and social services. It was often accused of stealing elections, most infamously the 1988 presidential vote. But PRI governments were also known for keeping a lid on organized crime, whose battles with government and each other under Calderon have taken more than 50,000 lives and traumatized the country. Repeating a popular belief of many Pena Nieto supporters, Martha Trejo, 37, of Tampico said, "He'll stabilize the cartels. He'll negotiate so they don't hurt innocents." Pena Nieto in his victory speech vowed he won't make pacts with organized crime, but rather will focus on curbing violence. Many predict he will build on Calderon's economic and security strategies but, working with a more friendly congress, may have more success. The main test of a new PRI will be how it handles corruption. The vote Sunday went smoothly with the usual protests at polling places that ran out of ballots and a few arrests for small cases of alleged bribery or tampering of ballots. Josefina Vazquez Mota of the ruling National Action Party, Mexico's first woman candidate for a major party, conceded almost immediately after the polls closed and exit surveys showed her trailing in third place. The preliminary count gave her roughly 25 percent. Her party unseated the PRI after 71 years in 2000 with the victory of Vicente Fox, who won more than 40 percent of vote, and again with Calderon in 2006, who won by a half percentage point over Lopez Obrador. "I think this will be a major setback," businessman Leonardo Solis, 37, said of the PRI victory. "I don't think they've changed much, but we'll see soon enough." 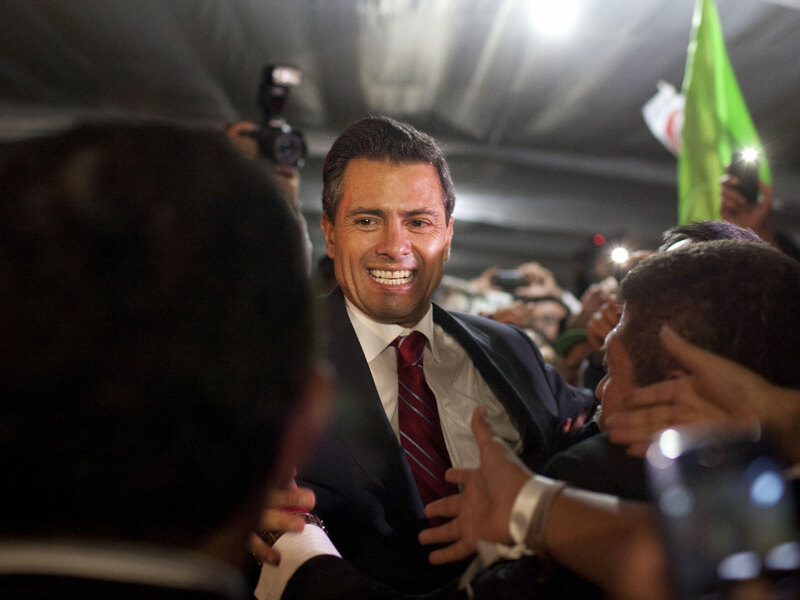 Still, the PRI may actually lose seats in Congress despite winning the presidency. The PRI-led coalition with the Green Party had about 38 percent of the congressional vote, with 92 percent of ballots counted on Monday. The coalition won about 46 percent in the last legislative vote three years ago. And while the PRI recaptured the governorships of the states of Jalisco and Chiapas, both of which it lost more than a decade ago, it apparently lost Tabasco, Lopez Obrador's home state, to Democratic Revolution. The leftist party also won the governor's race in Morelos, just south of Mexico City. At the PRI headquarters in Mexico City, a party atmosphere broke out as the national results came in, with supporters in red dancing to norteno music. Pena Nieto, who is married to a soap opera star, also has been dogged by allegations that he overspent his $330 million campaign funding limit and has received favorable coverage from Mexico television giant Televisa. University students launched a series of anti-Pena Nieto marches in the final weeks of the campaign, arguing that his party hasn't changed since its days in power. Pena Nieto praised their protests Sunday as a positive sign of the democracy and said he, too, wants to see Mexico change. "You have given our party a second chance," he said. "We will honor that with results."